Click on a link below to jump directly to the corresponding FAQ entry. WorkMatter is only for viewing document's notes and comments. You can not post any comments, nor delete. Posting comments, notes or deleting them is a feature available only in WorkMatter Pro. The other difference is on price : WorkMatter cost $0.99 whereas WorkMatter Pro with all the features cost $3.99. Both applications will be/are available on the AppStore. In the example above, the iWorkID is p123456789. The iWorkID is the value for the parameter 'a' that appear in an iwork URL. iWorkID usually start with the letter 'p' followed by a set of digits. First be sure that you are using WorkMatter Pro and not WorkMatter since the 'lite' version can not post any comments. #1 : If you are trying to post a comment on a Pages document, and the page has no existing comments then WorkMatter will not be able to post a comment. Pages document require the user to select either some text or some cell in the page in order to post the comment associated to it. Since currently WorkMatter do not authorize text or cell selection, the option to post a comment is disabled. #2 : if you are viewing a document that has been shared with you, it's possible the owner did publish the document in "read-only" mode meaning that you can only view the document and the owner's comments but you can not post any feedback. Contact the document's owner to enable the "Leave comments" options when publishing from Keynote, Pages or Numbers. 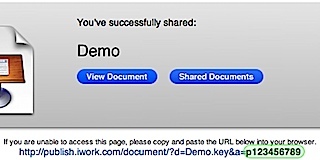 WorkMatter Pro and WorkMatter are able to retrieve the published information on iWork.com using some well defined protocols like HTTP, and WebDAV. In addition posting and managing comments use a defacto standard called JSON to send back and forth data between a server and a client. WorkMatter simply combine all those technologies and present the information in a nice and concise interface for your iPhone or iPod Touch.